Most here avoid it, but some have experienced it. I have done what I could to prevent it happening, but today I stumbled upon this looking at T-shirt designs online. A little over 4 years ago I created a simple "paper" prop, to use here in my various photo comps - both Blade Runner and 2001:ASO-related. I went ahead and submitted it here, in a form that all could access. It was a relatively simple build but the shape and content were unique. Perhaps I should at least try to get a free T out of it(?) X-Large, please . . . Sorry to hear this happened. I have seen people more and more lately using watermarks that cover the entire image to prevent these issues. Pay a visit to Smithfield, Kentucky...? 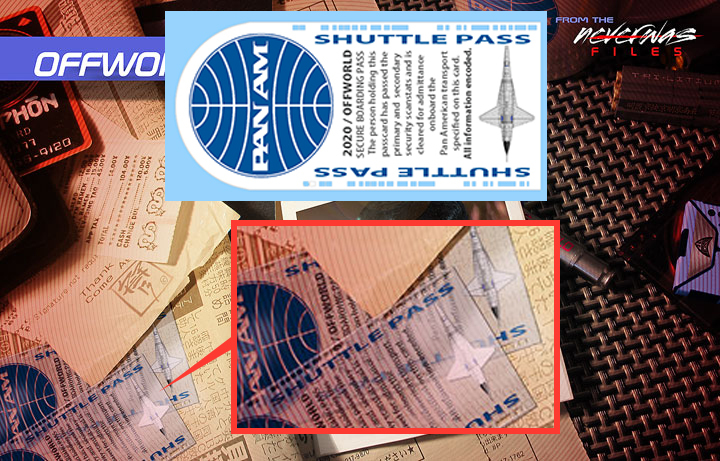 The seller looks to have at least made the file him/herself (the shuttle nose on yours hits right in the middle of the word "Pass", while it is significantly lower in his/hers), rather than just using yours. Well. Possibly, but since the fonts don't match, it could simply be a case of his font substitution not fitting the same. I noticed the simple change in the larger type. He could have simply selected the shuttle separately and moved it. I doubt he bothered otherwise. The layout is identical. I sent a note, although I doubt he will respond favorably. Either way, a simple proof of what can happen if more is posted here. I simply wanted to share a piece or two with fans - not finance someone's online business. The item's, thus most likely the auctioneer's, location, as per the posting. That is a bit interesting ... does it show different locations when the viewer is located on different continents, one wonders...? For me, it even states shipping costs through USPS (who only operate out of the US), so as far as shipping to Europe is concerned, it's definitely located over there. ___________International items may be subject to customs processing and additional charges. With another recent act of plagiarism of art now covered here, thought I'd revisit this episode now and see where it stands . . . I see the T is still listed at the same eBay address, so I contacted the seller a last time. I've never profited from this art - and had no intention of it. 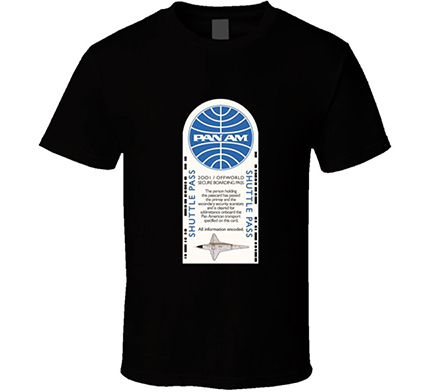 While the PAN AM Shuttle itself was not really a part of Blade Runner, the PAN AM logo was visible on a building in several cityscape shots in Blade Runner. The assumption is that it would service route's to the colonies. Yes, the ticket takes some creative license, but then there have been several others corporate links suggested, between Ridley's universes and with OUTLAND's CONAM as well, with various companies involved with "Off World" development . . .